Transport campaigners have called for a "rail revolution" to make train travel in Scotland faster, safer and greener. Transform Scotland said urgent investment and upgrades were needed. It has issued a list of key developments it said could help "bring cities closer together" and provide travellers with a "safe, civilised and sustainable" mode of transport. Transport Scotland said record levels of funding were being invested in the rail network. Transform Scotland is an independent charity that advocates sustainable travel and has a membership of about 60 organisations. 'Civic support' The group has called for a reduction in journey times from Inverness, Aberdeen and Dundee to the central belt through the electrification and doubling of rail lines. It also suggested a new direct rail link from Perth to Edinburgh, cutting up to 35 minutes off travel times from Inverness and Perth to the capital. According to spokesman Paul Tetlaw, the current 71-minute journey time from Perth to Edinburgh is slower than the equivalent journey 100 years ago when it took 65 minutes. "Scotland needs a rail revolution," he said. 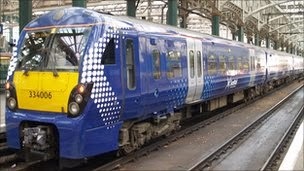 "Our campaign will build broad civic support for a planned programme of investment in the Scottish rail network over the next 15 years to bring all seven of Scotland's cities closer together with a safe, civilised and sustainable mode of transport and make Scotland's rail network fit for the 21st Century. "In doing so, we can reduce journey times, support travellers and commuters, create jobs, support the Scottish economy and reduce Scotland's carbon emissions." The Inter-City Express campaign is supported by Rail Freight Group, Capital Rail Action Group, the Friends of the Far North Line and the Scottish Association for Public Transport. Rail Freight Group spokesman David Spaven said: "The great thing about radically upgrading the rail infrastructure north of the central belt is that freight transport would benefit enormously, as well as passengers. Public satisfaction "With a fit-for-purpose Perth-Inverness railway, for example, we could increase the number of daily freight trains from two to as many as eight in each direction. That's the equivalent of taking more than 300 lorries off the A9 every day." WWF Scotland director Lang Banks welcomed the Transform Scotland campaign. He said: "Road transport is one of the biggest sources of carbon emissions in Scotland. If we're serious about meeting our climate change targets then we need to see a significant shift from road to rail and other forms of sustainable transport. "As a resident of Perth, I find it quite bizarre to discover that a century ago I could have made the train journey to Edinburgh much more quickly than I can today. "It's clear to see that increased investment in rail would be good for Scotland's communities, our economy and the environment." A Transport Scotland spokeswoman said: "Direct infrastructure investment by the Scottish government to reverse decades of neglect shows record levels of funding, with £8bn committed over the next two years, is already supporting around 50,000 full time equivalent jobs across Scotland - resulting in rail having ever-increasing passenger numbers and consistently high levels of public satisfaction compared to the UK average. "We are spending more than double per head of population on our railways than Westminster over the next five years and we are taking a distinctly different path to ensure rail travel is affordable by regulating more fares and capping increases at or under inflation." Transport Scotland also said it was continuing to work with ScotRail to address capacity issues where they occur on the Aberdeen/Inverness/Dundee services. The final study into a rail service between Edinburgh and Berwick-Upon-Tweed has been submitted to the minister for transport. The report recommends establishing a service from Edinburgh to Dunbar and Berwick-upon-Tweed, together with new stations at East Linton and Reston. The Sestran report was submitted to Keith Brown MSP. Russell Imrie, Sestran chairman, said: "The report shows that there is a clear social and economic case for improving access to rail along the Edinburgh to Berwick-Upon-Tweed line. "It would open up access to rail travel for thousands of commuters in East Lothian and the Borders, and offers major benefits for the local economies and tourism. "The study has been prepared in close liaison with Transport Scotland and we are grateful for all their input and advice. We also greatly appreciate that this proposal is included as a priced option in the draft ITT for the re-letting of the ScotRail franchise." Comprehensive service Michael Veitch, East Lothian Council's transport spokesman, said: "I'm delighted that after many months of hard work by everyone involved, this important report has been published. "It makes a robust case for a comprehensive local rail service between Edinburgh and Berwick serving the various stations in East Lothian. "I hope that it is received enthusiastically by the Scottish government, and, crucially, that it paves the way for the speedy re-opening of a station at East Linton." Gordon Edgar, Scottish Borders Council's executive member for roads and infrastructure, said: "This is a vital report for the future of rail travel on the East Coast, including the opportunity to re-open the station at Reston". "The publication of the report follows a recent announcement by Transport Scotland that the new ScotRail franchise would need to consider new stations at Reston in Berwickshire and East Linton in East Lothian, and is equally welcomed". "We hope the Scottish government will consider the report in full and give their support to all the hard work which has so far been carried out by SBC, ELC Sestran and Rail Action Group East of Scotland." A study aiming to increase the benefits to Scotland of the HS2 rail project has been announced by the UK government. The work by HS2 Ltd suggests high-speed services to Scotland and the north of England will start as soon as Phase One opens in 2026. UK transport minister Baroness Kramer said the project would "bring the UK together". Scottish Transport Minister Keith Brown said he was "excited" to work with the UK government on the plan. Phase One will consist of a new high speed rail line between London and the West Midlands, with a completion date of 2026. When Phase Two is completed in 2032/33, lines will run to Manchester and Leeds, the government has said. Phase one will see journey times between London and Glasgow/Edinburgh reduced from four hours 48 minutes to four hours, while these times will fall further to three hours 38 minutes when the phase two is up and running. The UK government, which has been holding talks with Transport Scotland, has instructed HS2 Ltd to look at further rail capacity and journey time improvements for northern England and Scotland. This is to include the possibility of eventual journey times from Glasgow and Edinburgh to London of three hours or less. Baroness Kramer told BBC Radio's Good Morning Scotland programme: "Scotland has always been part of the picture from day one of the high-speed project and will benefit from day one as soon as the first phase of it opens. "What we have always said is 'look, we can do more' and the study I have come up here to launch is to do exactly that." She added: "Scotland will already be getting £3bn in economic benefit and shorter journey times but we want to get under that three-hour benchmark and also look at other ways we can use to support the Scottish economy." Modal shift Scotland's transport minister said: "The Scottish government's position is that high-speed rail should come to Scotland. "I have said that to three different UK transport ministers," Mr Brown said. He said getting the journey times down below three hours would result in a "modal shift", meaning that people would consider rail as an option instead of road or air. "That's why the Scottish case for high-speed rail helps the UK case for high-speed rail," Mr Brown said. He called on the UK government's Scottish Secretary Alistair Carmichael to "unequivocally" back Scotland's inclusion in the HS2 network. He added: "You don't have to start this line in London and go north. Given the fact you don't have the same opposition in Scotland that you do in parts of England we could make a very quick start in Scotland." 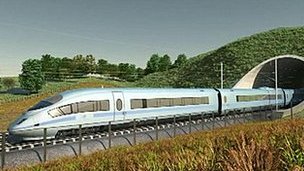 Emma Crane, the Scotland campaign manager of the HS2 Action Alliance, told Good Morning Scotland: "It is very important for the Westminster government for Scotland to approve of this project. But if you have a look at the facts and the benefits for Scotland, they don't really stack up at all. "92% of all rail journeys in Scotland begin and end in Scotland. There is very little cross-border travel so anything like this is not going to benefit a large proportion of the Scottish population." She added: "It is a London-centric policy which is going to cost Scotland a huge amount of money." Along with a few images from inside Moor Street Station, the bulk of these images are buses from the 'other operators' that serve the city centre. The main operator National Express West Midlands, will feature in the second set in due course.